Coll. No. 1939, 14 June 2018, characters observed: Perennial sedge; Habit: rhizomatous; Culms: to 60 cm., base, brown; Leaves: 2.0-2.5 mm. wide, green, margins, slightly scarious, sheaths, ventrally, tan + brown-dotted, smooth; Inflorescence: 17 mm. × 13 mm. wide, #4 spikes, loosely clustered; Spikes: identical appearing, sessile, 8 mm. × 6 mm. wide, gynecandrous; Bracts: 6.5 mm., short, proximal, 8 mm., setaceous; Pistillate scales: 4 mm. × 2 mm. wide, <perigynia, green mid-vein, brown laterally; Perigynia: many per spike, 4.3 mm. × 3 mm. wide, winged, veined both sides, glabrous; Beak: 1.5 mm., ±sloping to tip, serrulate; Achene: 1.7 mm. × 1.4 mm. wide, biconvex, oblong; Stigma: #2. Field Notes: Coll. No. 1939, 14 Jun 2018. 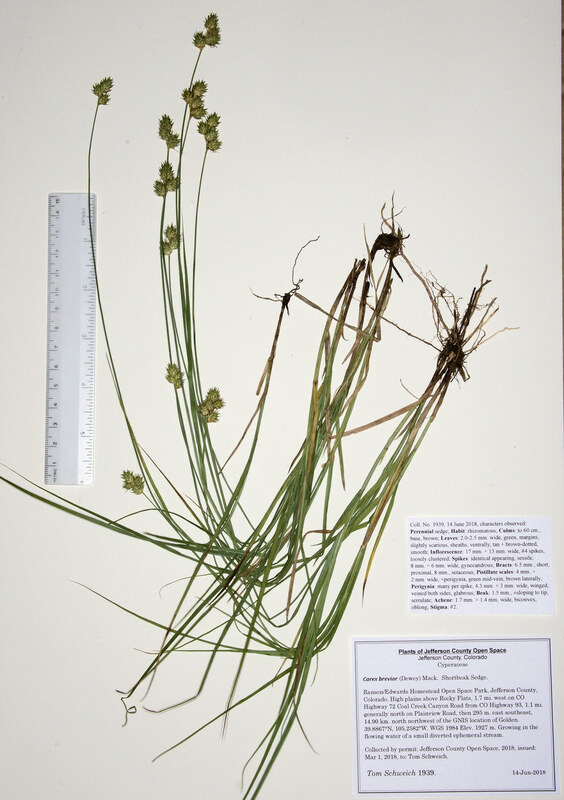 Other photos about Species or Cyperaceae Carex brevior.